This has been long overdue, I'll start by explaining what led me to post this. 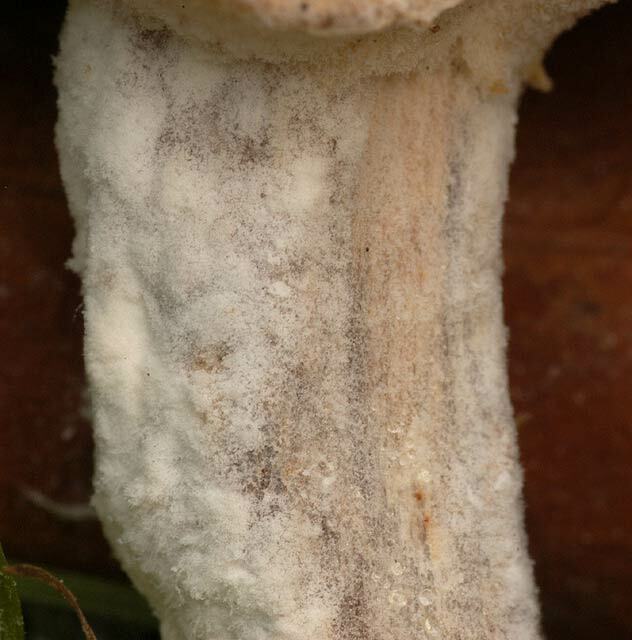 I've been growing mushrooms for a good 4+ years but not until fairly recently, after assisting with the cultivation of Agaricus bisporus, did I start to suspect that what I had always considered cobweb mold may actually be something else. 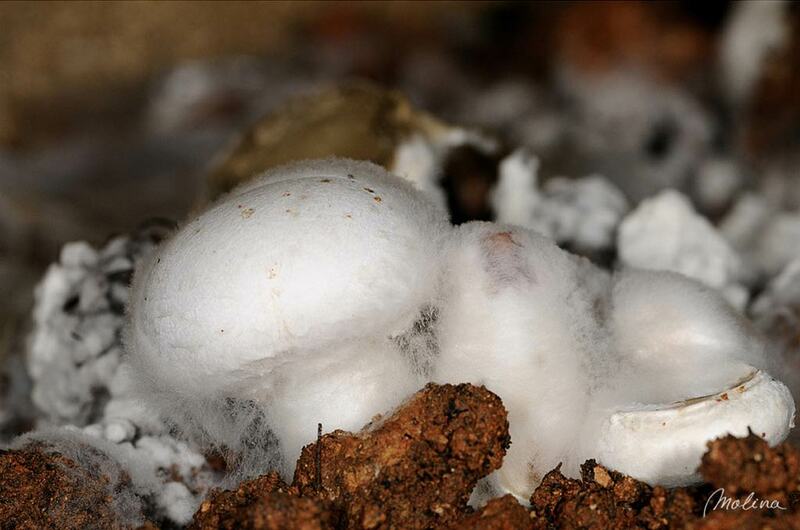 Unlike the competitor molds you're used dealing with cobweb mold is a mushroom pathogen. 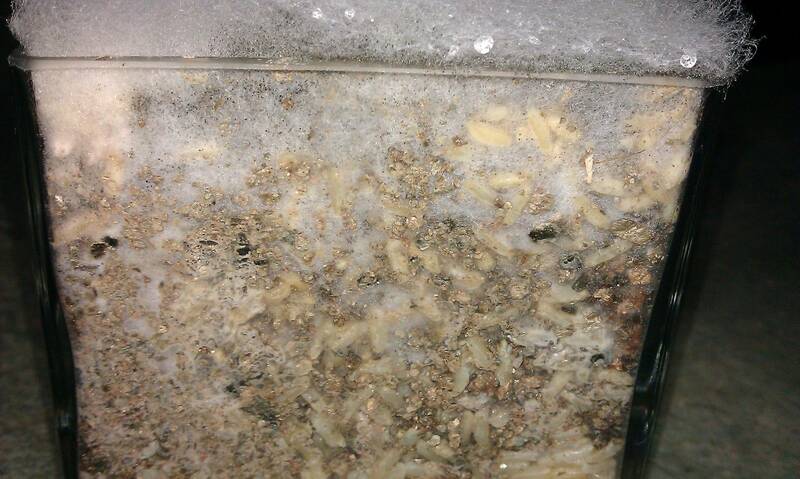 It's occurrence is in no way linked to contaminated spawn and is rarely a problem in bulk substrates. To ignore that and misidentify other molds as cobweb is counterproductive to determining the source of contamination problems and what to do about them. In trying to make sense of contradicting information I've read a huge amount of information from books, published studies, experiments, etc and thought I'd share some of it. Just to clarify things up front, the term cobweb mold is often used loosely to refer to any kind of thin wispy grey mold and that's not what I'm referring to. Hopefully I can help distinguish the difference between these molds and the specific mold that causes cobweb disease. 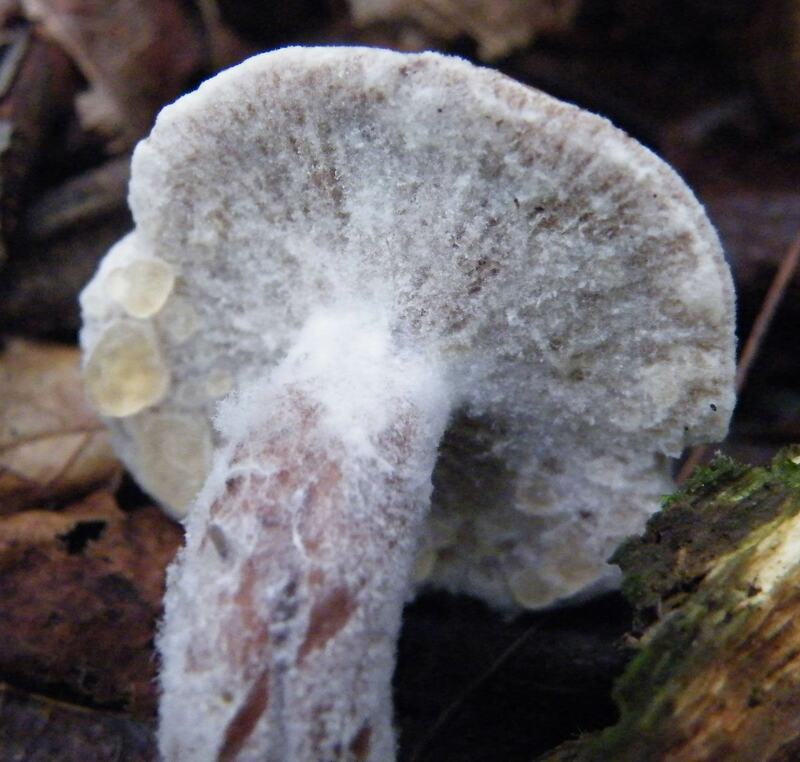 To start, cobweb mold could be defined as a group of closely related species capable of causing cobweb disease in mushrooms. Many of these species are so similar they can only be properly identified from each other through genetic testing. They've been reclassified over the years, and as is often the case in taxonomy not necessarily with complete agreement among mycologists, so you may hear different species or names mentioned. In the US Dactylium or the species Dactylium dendroides is usually referred to as the causative agent. In eastern countries you'll more commonly hear them referred to as various Cladobotryum spp. I also note the Shroomery main site mentions Hypomyces sp. which is also correct. In fact Dactylium, for the most part, is synonymous with Hypomyces rosellus. Cobweb mold grows on casing layers and mushrooms. Although in theory it could occur on any uncolonized substrate so long as a suitable host is present, it's been shown experimentally that neither spores or mycelium fragments added to spawn will result in development of cobweb disease, nor does adding them to the surface of bulk substrate substrate during spawning, even when a casing layer is then added over it. Cobweb mold spreads quickly. This is absolutely true, but it's rarely mentioned that the primary reason for this is it's ability to fragment and start growing from multiple points on the casing layer and not solely from the growth speed of a single colony. The growth rate is closely tied to the environmental conditions it is growing in. This is important for two reasons. A slower growth rate may be wrongfully assumed to rule out cobweb during identification. 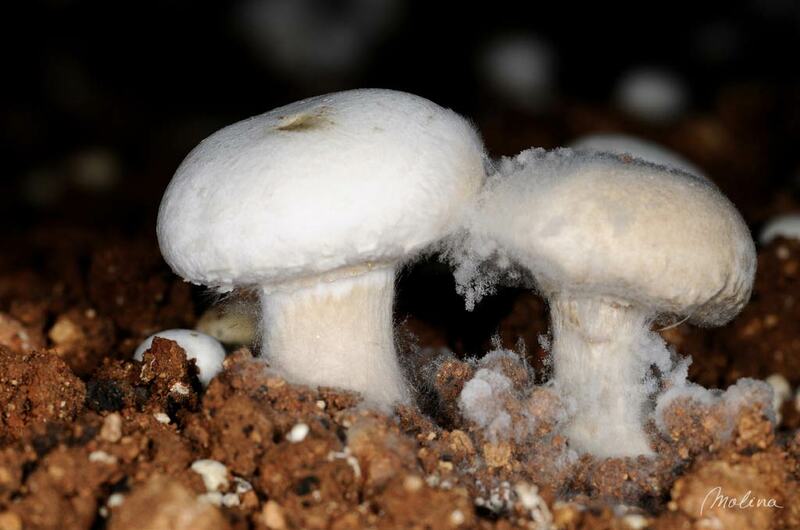 It's also important because changing these conditions can assist in dealing with an outbreak assuming the mushroom species being cultivated is able to tolerate the changes. Lowering temperature and/or RH can slow the growth of cobweb mold or even inhibit it completely. Cobweb is usually seen in later flushes. IMO this is important to consider both in terms of identification and in finding the source of the contamination. Cobweb proliferates mostly by means of spore. Even high amount of spores added directly to a casing layer requires weeks before the first sign of cobweb disease occurs. 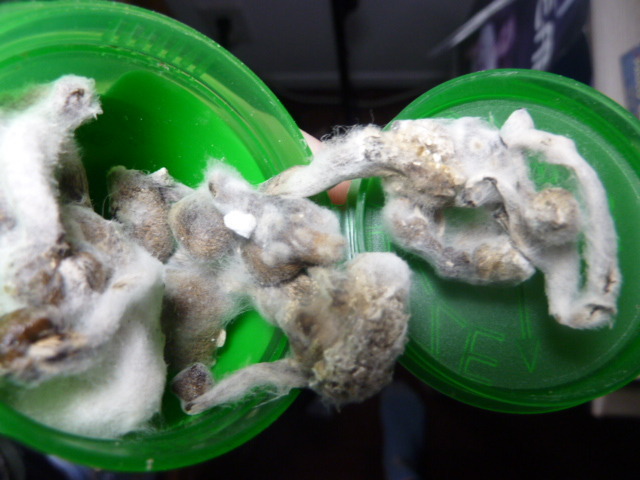 With that in mind any the appearance of actual cobweb mold in earlier flushes is most likely the result of mycelium fragmentation and that strongly implies a nearby source. This appears to be true despite the fact that the mold spores can germinate much more quickly on an actual fruit body. Mushroom stumps are a common point of origin. Now before anyone freaks out and reverts to twist-and-pull, this has nothing to do with the stumps rotting. A cobweb infected mushroom, whether apparent or not, may leave behind a cobweb infected stump. Aborts are an even more common point of origin. This does not mean aborts need to be picked immediately but they should always be removed while harvesting your other mushrooms. That can be a painstaking task if there is a very large amount of aborts. There are many look-alikes. I find it frustrating how quick people are to identify any fuzzy or grey mold as cobweb mold regardless of where or how it's growing. Pin molds, called that because of the black pins which they may produce, are commonly misidentified as cobweb. In contrast to cobweb, which occurs in the casing laying, pin molds are very common contaminants in spawn and some bulk substrates. In ideal conditions some species can grow at rates matching or surpassing those of cobweb. Despite their somewhat similar appearance these molds are far more difficult to treat and misidentification has apparently left some with the impression that actual cobweb mold is hard to treat. Cobweb is easily treatable. A common misconception is that hydrogen peroxide only affects cobweb mold. Peroxide will react in some way or another with pretty much any fungus, including mushroom mycelium. 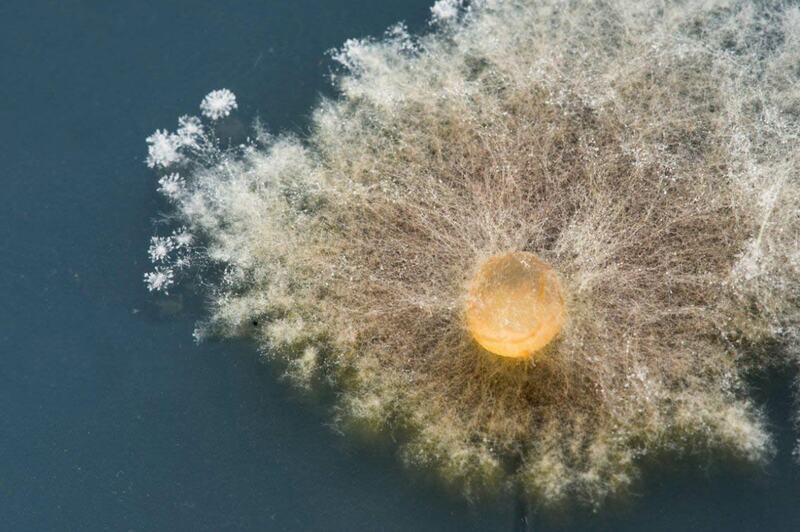 The most common reaction to fungi is fizzing caused by the rapid conversion of h202 into water and oxygen bubbles. The fact that cobweb grows solely on the casing surface is what makes it easier to treat than other molds. On a personal note, despite claims I find it increasingly hard to believe peroxide could be an effective treatment of actual Cladobotryum considering it's ability to grow inside the mushroom. It certainly doesn't match my own experiences nor have I seen any studies to support it nor any claim accompanied by documentation showing the mold could indeed be positively identified (visible spores, cobweb disease present). Whether this is due to misidentification or just differences in tolerance between strains/species I'm uncertain. However I confirm in cases where cobweb disease is present it can be controlled by placing a damp paper towel over the growth and pouring salt over it, and by removing mushrooms showing spotting symptoms. Some may be hesitant to try this, just keep in mind you're salting the casing layer, the damage to the mushroom mycelium is relatively small and there plenty of other areas for mushrooms to develop. That's part of the reason BTW Trichoderma almost always reoccurs once it's been growing in the spawn, Trich originating on a casing layer is much easier to treat. Of course no rambling of this nature would be complete without a RR quote. "Cobweb mold is the only thing you can totally kill and eliminate with peroxide. Nobody has lost a project to cobweb mold who has made searches here to find the cure. You're supposed to spray it until wet three times at 12 hour intervals. Spray until all the cobweb mycelium has 'melted' and disappeared. Repeat twice at 12 and 24 hours after the first spray whether you see any cobweb or not." 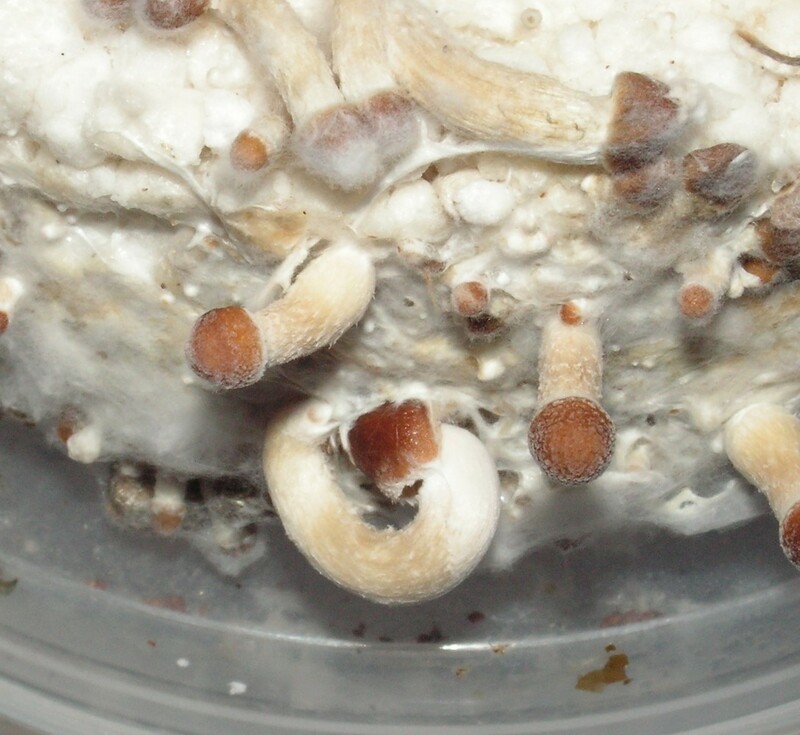 Overall cobweb disease does not appear to be particularly common with Cubensis, certainly not as common as many believe. Probably because most Cube cultivators do not use casing layers or use pasteurized casing layers. 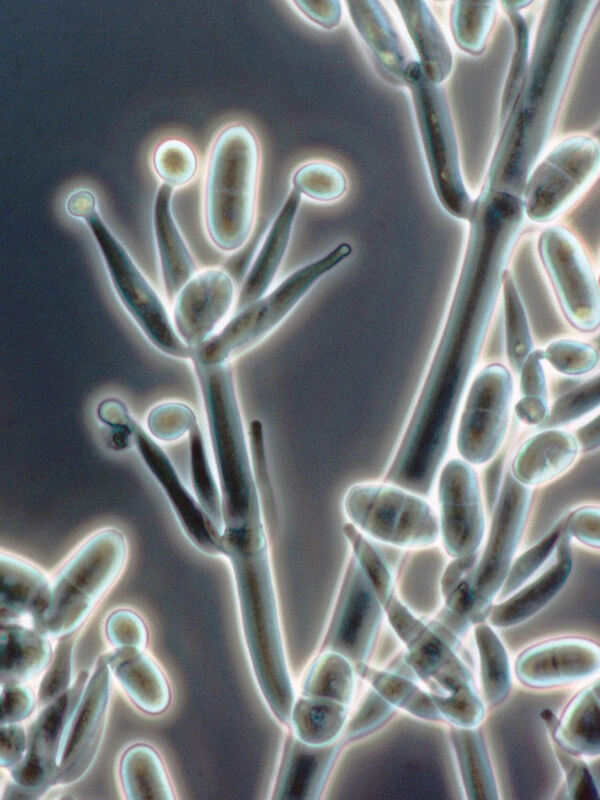 Spores of Dactylium are killed when exposed to 115-122°F. for only 1/2 hour making it extremely unlikely to survive pasteurization. 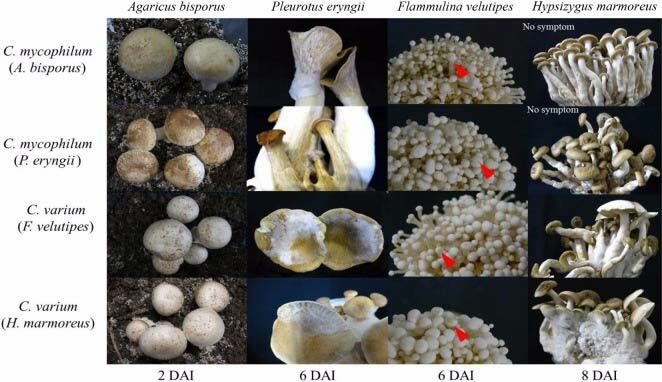 It's uncommon but possible for mushrooms to get the disease even without a casing layer. 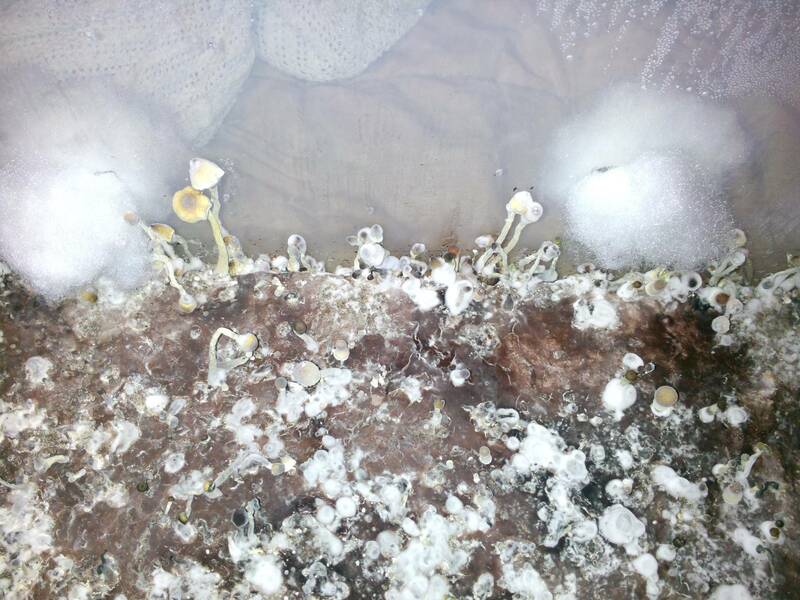 It such a situation the mold mycelium will not grow on the fully colonized substrates surface but may still be seen spreading to nearby pins and mushrooms directly. 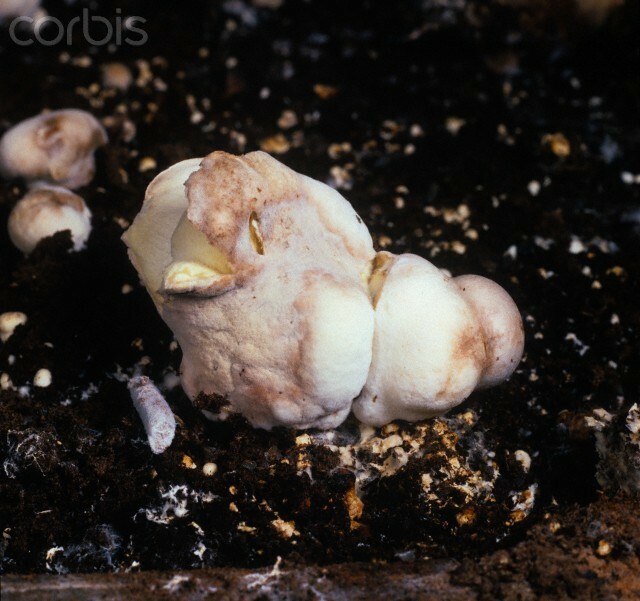 A particular species may produce different or no symptoms of the disease depending on the mushroom species being grown. According to one source Cladobotryum dendroides produces a noticeable odor while Cladobotryum mycophilum does not. Spores will not become airborne early on in it's development unless the colony is physically disturbed, like while misting. Spores are relatively massive. In the presence of typical air currents most spores will have settled after 15 minutes. Spores survive a maximum of 7 days in sterile water. 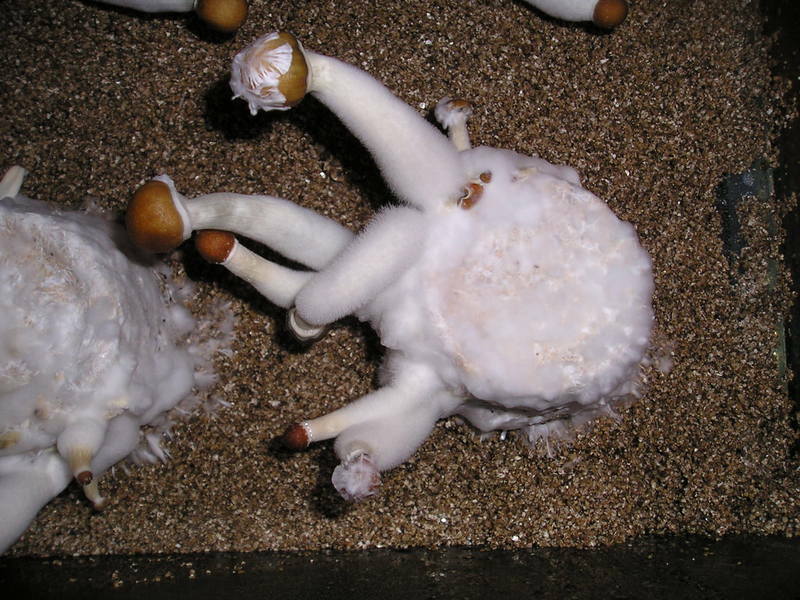 Heavy spore production occurs usually occurs near and on infected mushrooms. 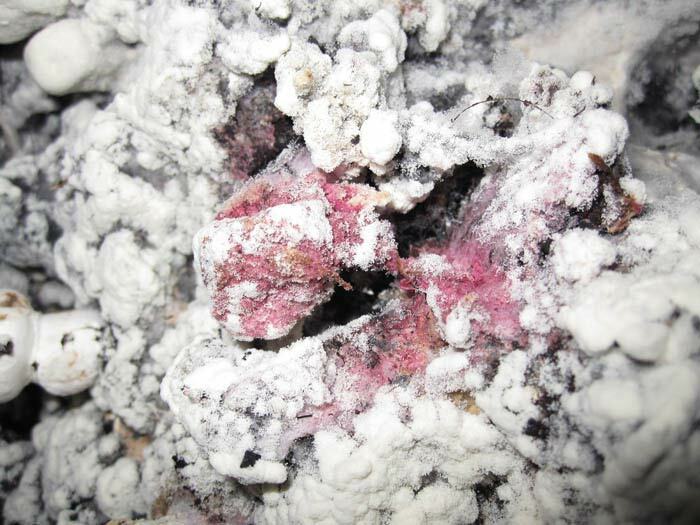 In time, some species produces metabolites which turn the mycelium and/or substrate a pink or yellow color. 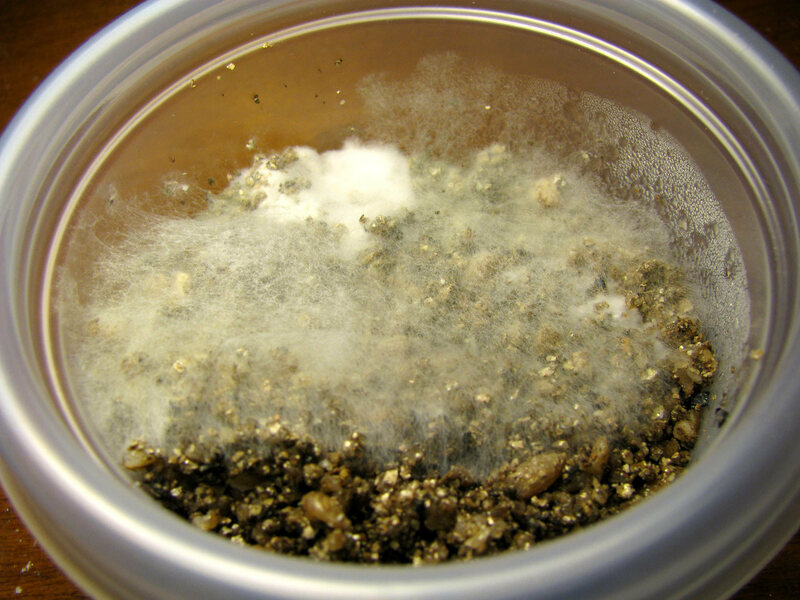 When the disease is allowed to progress the mycelium will take on a powdery appearance from the produced spores. The following are pictures positively identified by reliable sources. Spore production on 2 cobweb infected mushrooms. A culture of Cladobotryum mycophilium. Spore are visible here as well on the top left. An untreated outbreak in the late stage. This was from a study although the quality limits it's usefulness. The symptoms of 2 different species cobweb isolated from 4 different source inoculated into 4 different mushrooms species. The appearance on agar of 2 different cobweb species isolated from 4 different mushrooms. The effects of temperature on growth. Here are some pictures of cobweb on Cubensis which I should mention to my knowledge have not been identified beyond all doubt. Possible cobweb on partially colonized substrate. It's growing completely over the substrate and not over the mycelium. 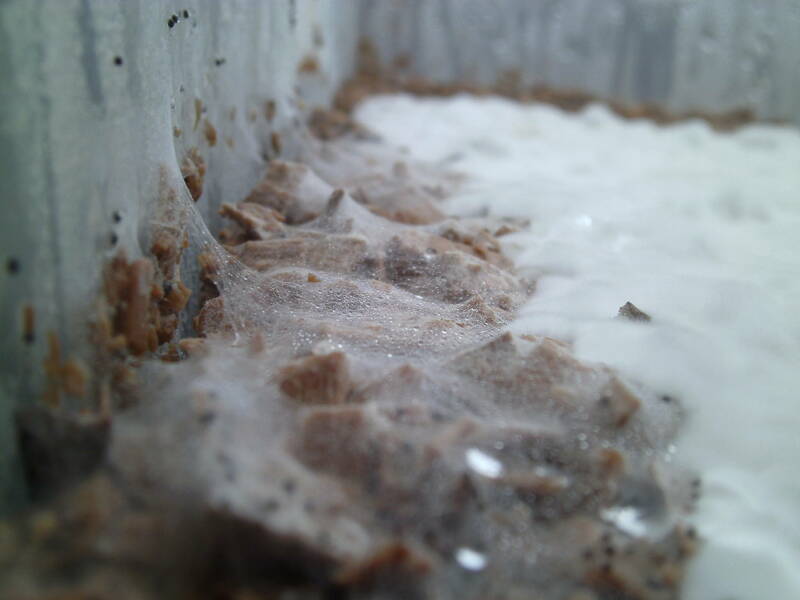 Cobweb on the (supposed to be) dry verm layer of a BRF cake. It's no coincidence that it didn't appear until the mushroom mycelium had grown through. That is a necessary for any visible growth on a casing layer, or in this case the equivalent of a casing layer. You can see the powdery of what appears to be spore formation. You can't even see them all anymore but there are pins and primordia under all those patches towards the bottom. However no spores for confirmation. Some things that are NOT cobweb. A perfect example of a pin mold which was thought to be cobweb despite the obvious presence of the black pins, and the immature white pins. Old mushrooms and stumps although if there was cobweb there I don't think anyone would notice. UPDATE: It's been a while since I posted this. I think I can say without a doubt now that actual Dactylium is not killed by 3% hydrogen peroxide. I have however discovered there are a couple Mucorale (pin molds) species that are when growing in anaerobic conditions. Or in other words they grow when gas exchange is lacking or when the substrate is oversaturated with water. They also do not sporulate under those conditions so if you're seeing the black pins they've establish themselves well enough to compete with the mushroom mycelium even after conditions are fixed and you've most likely already lost the opportunity to fix the problem.